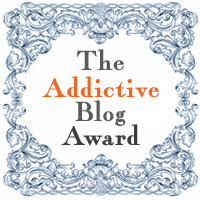 It’s gone two weeks since I opened up my laptop and dived into the wonderful warm world of blogging only to discover that the Addictive Blog Award had been sent my way! It comes from the lovely Anne who writes Is Anyone There? You wouldn’t think there was a Turkey connection in a blog by that name but there is! She and her family came to Turkey many years ago and with a few adventures along the way, have continued to visit from the UK: this is what she blogs about. Anyway, not surprisingly, I was very pleased. Winning something is reminiscent of schooldays like getting A for Best Essay or French Composition. I liked getting As and at this much later stage in my life, I get a real kick out of these informal blogger awards. The name of this award is a bit ambiguous I feel but apparently what it means is that I have to say why I started blogging – and presumably why I have continued. I began just more than 2 years ago, amazingly. It all started with a suggestion from Daughter No1 who saw that I was looking for some structure to my days, teacher that I am, and you know what? Blogging has been the perfect answer for me. I love it: I love the fact that it is at the back of my mind a lot of the time, the fact that I am constantly on the look out for new topics to blog about and interesting recipes to engage with. As a result of my blog, I now have a completely new hobby, photography. I never considered the fact that of course pictures were going to be integral to posts about markets and food. Can you imagine? How naive was that? So I have thrown myself into it and to my surprise and delight, am getting more and more hooked. What I am also hooked on is the friendships that one builds up with other bloggers through following their own blogs and commenting on them or receiving in turn their comments. It’s wonderful and yes, in its own special way, could be called addictive! I hope you enjoy them and thanks again, Ann! Claudia, Your blog certainly is addictive for those of us who love to make and eat good food. Your description of the joys of blogging ring so, so true for us as well. And you may have only recently taken up photography but we are always amazed by how wonderful the photos in your blog are. We can't wait for our next "fix." Well done Claudia. Love all your recipes and the photographs that go with them. BtoB: thanks for your warm comment! We love your blog, and your recipes.